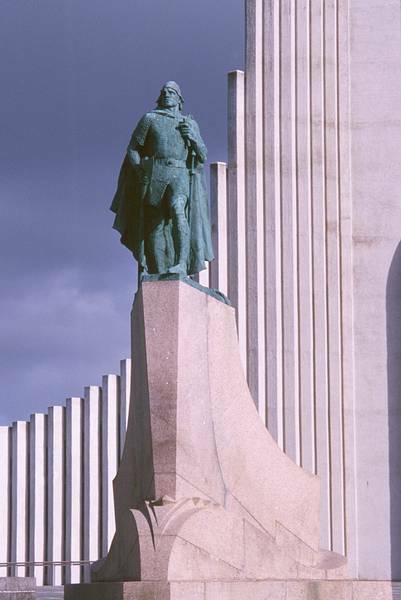 Today, October 8 is Leif Eriksson Day in the U.S. About 1,000 A.D., Leif and his men sailed from Greenland to what is now L’Anse Aux Meadows in northern Newfoundland, Canada. He beat Columbus by nearly 500 years to be verifiably the first European to set foot in North America, where he built an outpost. The sculpture was created by Alexander Stirling Calder, father of Alexander “Sandy” Calder known for his mobiles, and stands now in front of the Hallgrímskirkja in Reykjavik, Iceland. 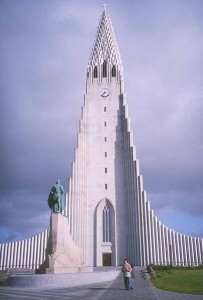 It was a gift from the U.S.A. in 1930 to commemorate the one thousandth anniversary of the world’s first democratic parliament, the AlÞingi, at Þingvellir, Iceland in 930 A.D.
Leif Eriksson’s sister-in-law was Gudrid, the Far Traveler, and his father was Eric the Red, who settled Greenland. All three are extolled in the sagas. This entry was posted in life in general, Norse, sculpture and tagged Calder, Eric the Red, Gudrid the Far Traveller, Leif Eriksson, sculpture. Bookmark the permalink. Post a comment or leave a trackback: Trackback URL.